She. She has worked for one of the world’s leading Formula 1 team. She is a fighter pilot. She is UN’s goodwill ambassador to advance gender equality. She’s changing the contours of this country. And she is not a man. 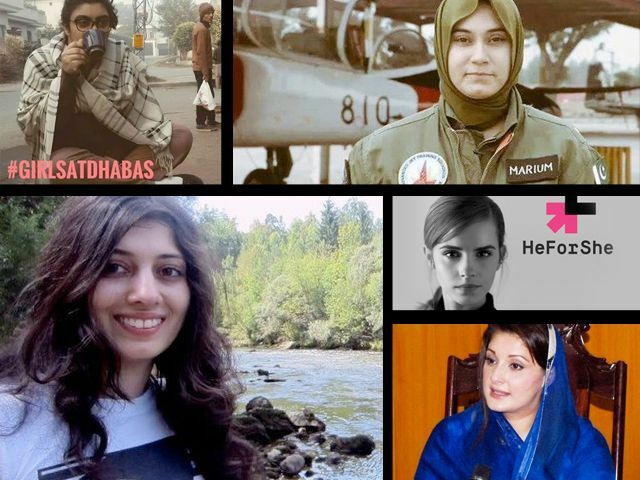 In recent years, Pakistan has seen a lot of “firsts” owing to women. At the tail end of 2015, Rahila Hameed Durrani was elected as the first-ever female speaker of the Balochistan Assembly. Muniba Mazari was named Pakistan’s first female goodwill ambassador to advance gender equality and the empowerment of women and girls by UN Women. Iron-fisted Ayesha Mumtaz gave owners of sub-standard eateries in Punjab sleepless nights as Director of Operations at Punjab Food Authority, and rose to fame thanks to her unrelenting firmness during raids. And fighter pilot Mariam Mukhtar added the name of a woman in the list of Pakistan Air Force fighter pilots to die in the line of duty. The year has been particularly significant in bridging some of the gender disparity that the country battles day in, day out. What initially started as a hashtag, #GirlsAtDhabas ended up becoming a jump start to fresh conversation about how women can – and must – frequent all public spaces, including dhabas, police stations, courts and even mosques. The social ripples are many, but there is little simultaneous effort at the state level, and there is too low a number of senior female politicians, female politicians in important decision-making positions, female CEOs and judges. In a recent write-up, former vice chancellor of the Lahore University of Management Sciences (Lums) Adil Najam suggested that after 137 male justices of the Supreme Court of Pakistan, the time is ripe to appoint a woman. But top positions in all spheres, for the most part, continue to be ruled by men. She says there is little discourse in what feminism actually is, even within the women’s movement and women’s NGOs. “Few, if any, would recognise the iconic names of the feminist movement such as Judith Butler or Simone de Beauvoir, or even Pakistani feminist icons such as Tahira Mazhar Ali, Nighat Saeed Khan, Nigar Ahmed, Shahla Zia or Farida Shaheed,” says Lari. She adds that it is a pity that we do not institutionally focus enough on the ideology and choose to focus more on finishing projects. On a more upbeat note, Rumi observes that within the dynastic framework, another woman leader – Maryam Nawaz – is emerging within the PML-N, which has been known for its conservatism. 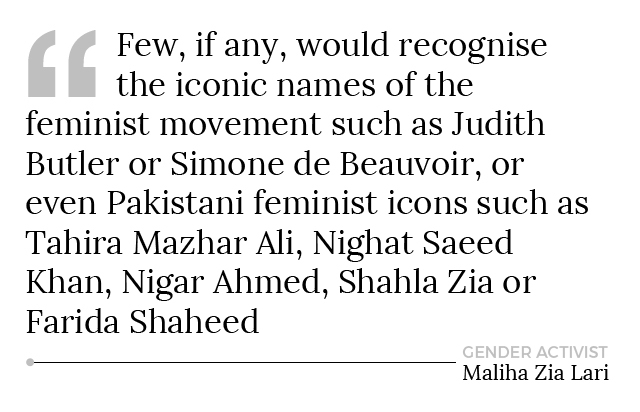 Yet, Permal recognises that leave alone male feminists, even women in Pakistan sometimes have a knee-jerk reaction to the term, seeing it as a borrowed Western concept. “Our deeply patriarchal society has so pressed misogyny into the bare bones of the populace that even many women are anti-feminist, allowing their religio-cultural dogmas to supersede the support of their own gender,” says Permal. Fortunately, women like Suniya Sadullah are blazing the trail for others. In Suniya’s family, the only professions considered respectable were becoming doctors or teachers. But she had other ideas when, at the age of 12, she watched her first ever motor race on TV. Her aim in life there onwards became to be a part of a Formula 1 team. She has succeeded in pushing the boundaries of the norms of a traditional Pathan family and realised her dream: this motorsport engineer is the first female Pakistani to have worked for the Williams Formula 1 team. “I’ve had an unconventional career route for a girl from Khyber-Pakhtunkhwa,” she tells The Express Tribune. Globally, too, the importance of bringing men on board for empowerment of women has gained momentum, and though feminism started out as a movement by women for women, men are now seen as part of the synergy. “HeForShe”, a solidarity campaign for gender equality initiated by UN Women, popularised the thought further. HeForShe started a campaign with the goal of engaging one million men and boys by July 2015. They may have failed to meet the goal, but supportive men are not as rare as they once were. Posted in Gender, Women and tagged gender, Mariam Mukhtar, Pakistan, Pakistani women, Raza Rumi, Women's Rights. Bookmark the permalink. Are Pakistani women clinically obsessed with clothes? Every evening after iftar they storm the streets in flocks, like contingent troops, with one and only one purpose alone – they want clothes, clothes and more clothes. 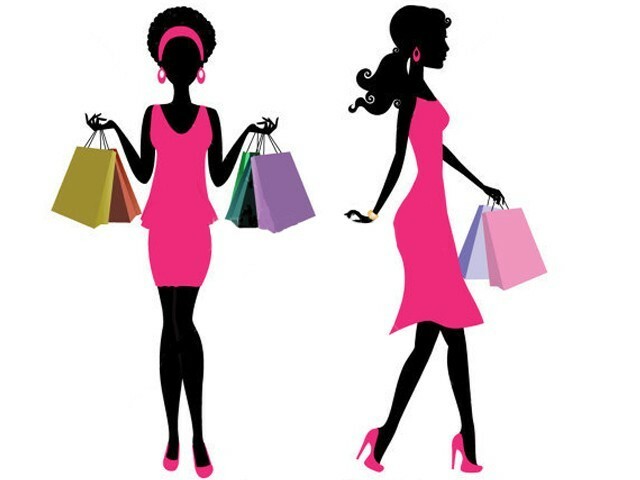 The women of Pakistan, it seems, have found the reason as to why they were created – they were created to make, buy, sell, maintain, wear, show and love clothes. And this sad obsession is across the board. From lower middle income groups to the elite, they spend big chunks of their valuable time in bazaars and malls, and unanimously spend more than they afford. And Eid season sees this obsessive compulsive behaviour at its peak. But then, can we really blame them? At every turn of the head are billboards of women; beautiful, stick thin, photo shopped women, wearing dresses to kill. The biggest viewership of Pakistan’s thriving morning show industry is women. Millions of Pakistani women, every morning, lap up the mostly unintelligent and fake conversations on these shows and take them as gospel truth. They also absorb each and every attitude and trend being presented by the baajis and even the bhaiyyas who are the hosts. Thus, they have started believing in a culture of collective gushing and adulation of people on the basis of what they wear, not who they are. If they can afford the exact thing the host is wearing (even though hers might is most probably a borrowed dress – one that she will never wear again), they will get it from the same designer. If not, the women will use every ion of creativity God has given them to dojugaar and copy the design, almost flawlessly. Women from the elite have their own issues. They are also obsessed with clothes. Only, the taste (acquired) and the social circles are different. They will kill themselves over clothes that are original, exclusive, subtle and elegant. They may not be as tacky as others and may look down upon other women, and ridicule their showy dress sense, but eventually they are equally consumed with the idea of the “I am what I wear” syndrome. The only difference is, the elite do it in more innovative ways. They make politically and socially correct statements with their clothes if they are the activist types and use pure cottons, vegetable dyes and the works. If the social circle involves kitty parties and the trophy wives club, the style changes considerably. Women see, breathe and dream clothes. It is no wonder then that not only is there a never ending demand for clothes, but also an incessant chain of supply in the form of dress ‘designers’; couture designers who have actually studied the art and also those who become designers by default – because… well it comes naturally to them after thinking about clothes 28 out of 24 hours a day. And then there are those who don’t really design anything but just have a darzi at home in the basement. The problem is not with clothes. The problem is with the shift in values that is coming with it. Slowly but surely it is becoming such a big priority for women that the way they see themselves and others is changing. I noticed this the other day when I caught myself not saying “you look very nice in this dress” to a friend, but saying “your dress is very nice”. The person was taken away from my compliment. All that remained was the dress. If women start viewing themselves in light of the praise their dresses get, they will continue to be preoccupied with their appearance. And this is an expensive preoccupation as well as time-consuming. I know families where a driver is employed for the sole purpose of taking baaji toGhousia market, Aashiyana and Raabi Centre. Wardrobes are so important to females that in order to make unnecessary clothes that will keep hanging in their closets, untouched for a year, they want to earn and for that, voila, they become dress designers. Being engrossed with clothes to a disturbing extent is an attitude that other women observe. If they cannot afford to do the same, there is an underlying resentment and unhealthy sense of competition in society. The more we raise the bar of our wardrobes, the more the economic disparity in our society. While dressing well and looking good is actually an admirable thing, anything that crosses limits becomes toxic. Overdoing one thing means you will end up under-doing something equally or more important. The time one could spend reading, doing some form of community service, or spending unhurried moments with one’s family is spent getting exhausted, carrying bags and bags of stitched and unstitched fabric, and still worrying whether everyone will like it or not. The next time you exhaust yourself over clothes, stop for a minute and think: Is this really worth it? Women are naturally very good at time-management. And Pakistani women are an amazing potential work force for Pakistan. They are talented, intelligent and hardworking. If the time they put into clothes is utilised for other more productive things, it would make Pakistan a much happier place. The spirit of Ramazan and then Eidul Fitr is all about taking away materialism from our hearts and reviving a culture of simplicity, giving and sharing. It may be time to sit back and rethink what Eid is all about. Posted in Women and tagged clothes, couture, Eid, Eidul Fitr, Express Tribune Blogs, Farahnaz Zahidi, Islam, israaf, israf, obsession, Pakistani women. Bookmark the permalink.